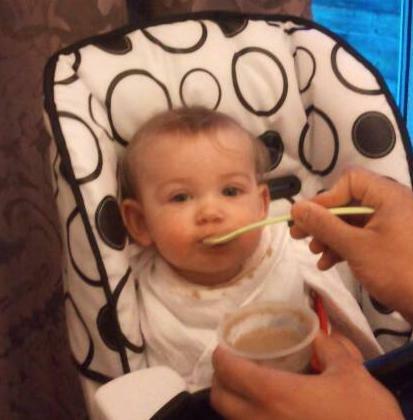 My Mummy's Pennies: Mummy Saving Review - Plum Baby Stage 1 weaning meals! Mummy Saving Review - Plum Baby Stage 1 weaning meals! I am a second time mum and with my eldest all his weaning meals were made from scratch. I bought a shelf full of baby cookbooks and spent a couple of afternoons a week preparing, cooking, pureeing and freezing organic fruit and vegetables for my little boy while he had his naps. I very rarely bought pre-prepared baby food and if I had wanted to there were few options, those that were available came in jars with a long list of unnecessary ingredients and additives which really put me off. Three years on and things have changed! I still want the best for my little ones and homecook as much as I can, but I now have a three year old to entertain while my daughter has her naps and I just don't have the time to make every meal from scratch. Another thing that has changed is the choice of baby foods available! Many of them are now organic and as well as jars there are pouches and pots to choose from. 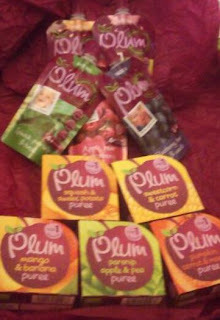 I was delighted to be given the opportunity to review a selection of Plum's stage 1 foods. When they arrived I opened the box to find a lovely selection of both sweet and savoury pouches and pots for my daughter to try. The selection included 5 pots and 6 pouches in 100g portions. The varieties were Parsnip, apple & pea, Spinach, parsnip & basil, Squash & sweet potato, Pumpkin carrot and mango, Mango & banana, Apple, Pear & raspberry, Sweetcorn and carrot, Blueberry, banana & vanilla, and Peach & pear. The look of both styles of packaging really appeal to me, they are bright and colourful but also have a natural feeling about them. On the pouches I especially like the images of the main ingredient on the front with a cute little photo of a baby inset, this really makes me relate to the brand. The packaging clearly states what's inside and what age the ingredients are suitable from. The 'badges' on the front of the packaging tell me that the the product is organic, contains the 'supergrain' quinoa, and is 100% natural, with no preservatives. The back of the pouch has a clear and pleasantly short ingredient list and gives simple storage and serving instructions. And so to the eating! Although at Six and a half months Elizabeth is new to solids, she is an independent little lady and already knows what she likes, so I was very surprised after trying all of these Plum stage 1 meals with her that there was not a single variety that she appeared to dislike (maybe it's just mummy's cooking?!). Her absolute favourite (judging by the speed she ate it and the lack of spillage onto her bib) has to be the squash and sweet potato puree, (I have to admit I licked the spoon myself and can see why she likes it!) This is great because being a vegetarian, I use both these vegetables in family meals on a regular basis, so this gives Elizabeth a great introduction to what she'll be eating in the future! I really love the wide range of varieties available and was pleased to find that as well as the ingredients being organic all the meals contain the nutritious 'supergrain' quinoa, which again I use regularly in family meals! I love the convenience of the pouches, you can squeeze them straight onto a spoon to feed and they are ideal for the early stages of weaning where baby is only having a few spoonfuls at a time, as you can pop the lid back on and store in the fridge for up to two days! They are also great when out and about, all you need is a spoon and a bib! However one negative point I must raise is that the pouch packaging does not appear to be suitable for recycling, which does put me off using them too often. The packaging on the pots however does clearly state that they can be recycled. Although i've mainly been using the pots when at home they could also be taken out and about easily, they have a resealable lid and the contents will also last in the fridge for up to 2 days after opening or can be frozen in ice cube trays to last even longer! At an RRP of just 99p per pouch/pot I do think these are good value for money. They contain natural organic ingredients which I personally am always prepared to pay that little bit more for. I would certainly recommend these to other busy mums who are looking for convenient but natural and organic first weaning foods for their baby. After trying the Plum stage 1 purees with Elizabeth I will definitely be purchasing them to use when out and about or for those days I just don't have the time to cook her meals from scratch! And we look forward to moving on to the stage 2 meals with even more exciting tastes, very soon! This review was written by myself for the mummyzwordz site, check out their reviews of other plum baby foods here! You can find out more information and buy the stage 1 meals from the Plum Baby Website here!